While I agree with the sentiment, I think that some of Kersey’s theories did a disservice to SP types by constraining them into an art-making, hedonistic stereotype. There’s so much more to them than that, and I think by simply focusing on their shared SP traits we lose a lot of the nuances of each of these four type. I doubt this was his intention, but that’s how people seem to have used/misapplied his theories. Even though Keirsey’s stated intention was to make sure SP types were appreciated for what they can do, one of the (I assume unintended) consequences was that he contributed to the idea that Intuition is in some way “higher” than Sensing. This is simply untrue, and spreading myths like this about Sensing types does a huge disservice to about 70% of the population. Keirsey based a large portion of his theory for grouping the 16 types into four categories on Plato’s Republic. The NF types are therefore Plato’s “Philosopher Kings,” who play a moral role in society, and NTs are the Rationals “endowed with reasoning sensibility” (Please Understand Me II, p. 23, 118, 163). Not only does this demonstrate poor understanding of Plato, but it pushes the Sensing types into categories defined by art-making (SPs) and caretaking (SJs). There’s nothing wrong with filling artistic and guardian roles, of course, but this system gives Intuitives an excuse to think of themselves (and no one else) as intellectual and moral leaders for society. Sensing types also have rational, intellectual, and moral contributions to make and their perspective on those topics is just as valuable as an Intuitive’s insights. Similarly, Intuitives can also fill artistic and care-taking roles. Myers-Briggs theory is about how our minds work and the motivations behind what we choose to do. It’s not meant to pack us away in boxes. In Myers-Briggs theory, we describe the way peoples’ minds work using psychological functions. Sensing and Intuition are both Perceiving functions. We can also call these “learning functions,” because we generally use those processes to take in new information. The other functions, Thinking and Feeling, are called Judging functions because we use them for decision-making. In addition, each of these functions has an orientation to the inner world (Introverted) or outer world (Extroverted). Continuing with the SP types as our example, they all use Extroverted Sensing (Se) — a learning-process that’s oriented to the outer world. For ESTP and ESFP types, this process is their dominant function. ISTP and ISFP types have Se as their co-pilot function, and rely on either Introverted Thinking or Introverted Feeling for their dominant function. Most of Keirsey’s description of the SP types focuses on their use of Se, and he tends to ignore the role other functions play for these types. Thomson agrees that the outward behavior of the four SP types looks similar. After all, they’re all interacting with the outer world using the same Extroverted Sensing process. 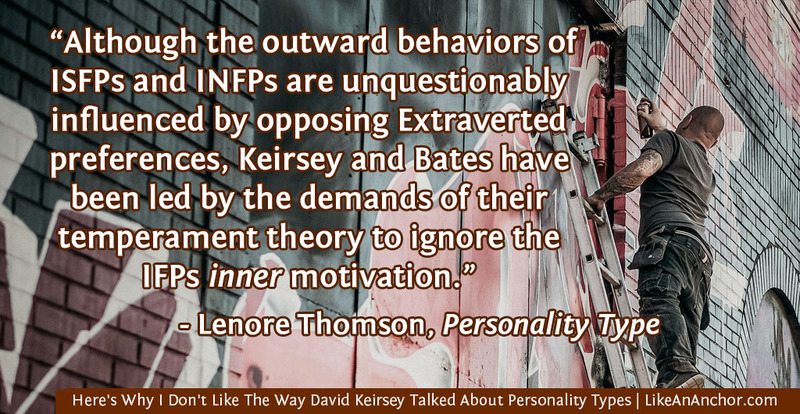 But “Keirsey and Bates have been led by the demands of their temperament theory to ignore the IFPs [and ITPs] inner motivation” (Personality Type, p. 372). One could also say the same thing of the ESPs, though to a lesser extent. Is It Sensing, or Extroverted Perceiving? 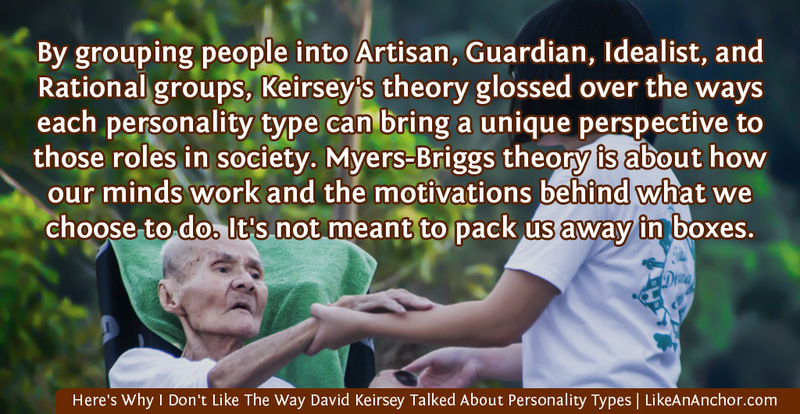 I think Keirsey was so invested in fitting Myers-Briggs types into four groups that he ignored traits shared by types that he didn’t see as related. 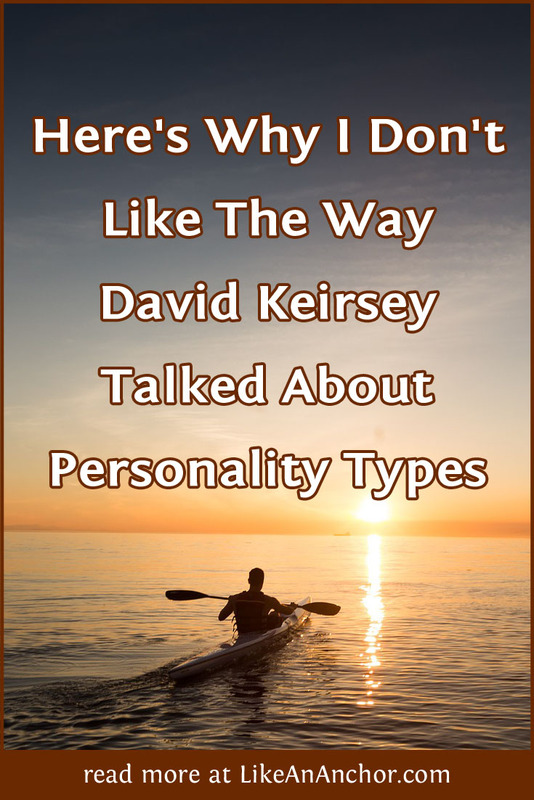 For example, Keirsey talks about certain traits that all P-types (especially EPs) share as if they were only part of an SP type’s make up. He describes SP children as “easily wound up,” easily bored, and “ever on the lookout for some sort of risky business or mischief to get into, just to keep things interesting” (Please Understand Me II, p. 257). You can easily describe ENP children the same way, though, because they’re driven to explore the outer world just as ESP children are driven to experience the outer world. I would guess that ENPs are just as likely as ESPs to be described as difficult to parent, and both probably find themselves over-diagnosed as ADHD due to their natural personality traits. To offer one example, my ENFP ex-boyfriend‘s mother described having to turn his crib upside down over his mattress after he started walking because he would escape and leave the house to go exploring. One of the biggest strengths of the Myers-Briggs system is that it gives us a framework to describe the different ways our minds function, as well as how different mental processes work together. But there are limitations to what this theory can tell us. Myers-Briggs types should be used to explain how our minds work — to describe the mental “hard-wiring” that each type uses most readily. They should never be used to make rigid statements about groups of people. People are individuals, and any good personality test acknowledges that. We cannot say things like, “All ISFPs are artists” or “ESTPs are all tactical-minded entertainers” and expect to be right. This sort of thing usually deteriorates very quickly into typeism (yes, it’s a thing). That’s why you’ll see (false) statements like, “ISTPs are should work in mechanics, not business” or “You can’t trust an ESFP to follow through on anything” tossed around as if they were gospel truth. Unfortunately, Keirsey’s theories contributed to these problems. The nicknames he gave each type and the generalizations he made while fitting the 16 types into 4 categories have colored how we see them ever since, and not always in a good way. If you want to study how the types might relate to historical systems like Galen’s four humors, then Kersey is a good resource. But if you’re trying to stick closer to Jung and Myers-Briggs, and do justice to the nuances within all 16 types, then perhaps he’s not the best source. I see where you come from when it comes to ignoring motivations. I love enneagram for that, and though I think MBTI is amazing, enneagram has a different perspective that I enjoy when working into a person’s ideals/motivations. I’m not an expert at it, but I’ve used it for my characters in my writing for about a year and I feel pretty confortable. It’s really interesting.